This set of multiple choice objective questions on PHP language basis includes MCQ questions on PHP variables and identifiers declaration, superglobal variables, uploading files using POST in PHP and errors occurring on it. 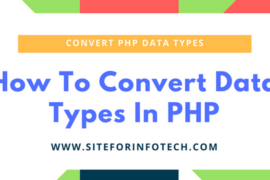 It also includes MCQ on define( ), include( ) and require( ) functions used in PHP, operator associativity, examples of expressions and loops, Heredoc and Newdoc syntax used in PHP. 2. State whether the following statements about identifiers are True or False. iii) An identifier name can be identical to any PHP’s predefined keywords. 3. The ……………………… is a superglobal variable that stores information passed into the script through HTTP cookies. 4. While uploading files using POST in PHP, an upload status code ………………… will be populated while the file size exceeds the maximum size imposed by the upload_max_file size directive. 5. ……………… error will occur when the file size exceeds the maximum size imposed by an optional MAX_FILE_SIZE hidden form field parameter. 6. The ………………………. superglobal is a catch all of sorts, recording variables passed to a script via the GET, POST and COOKIE methods. 7. The …………………….. superglobal array can be through of as the superglobal super set and contains a comprehensive listing of all variables found in the global scope. 8. The ………………… function in PHP defines a constant by assigning a value to a name. 9. The optional parameter …………………. is included and assigned TRUE, subsequent references to the constant will be case insensitive. 10. ……………….. are particularly useful when working with values that definitely will not require modification. 11. Which of the following is/are the examples of expressions used in PHP. 12. The PHP operator index enclosure [ ] has ………………… associativity. 13. The PHP operators Boolean AND and Boolean OR [ && || ] has ………………… associativity. 14. State whether the following statements about for loops in PHP. i) The first expression in for loop is evaluated by default at the first iteration of the loop. ii) Any of the expressions can be empty, their purpose substituted by logic embedded within the for block. 15. …………………. in PHP offers a convenient means for outputting large amounts of text. 16. State whether the following statements about Heredoc syntax are True or False. ii) It can be preceded with spaces or any other extraneous character. What will be the output of the code. 18. The ………………………….. statement will evaluate and produces the same result as copying the data from the file specified into the location in which the statement appears. 19. If …………………… is placed within an if statement, that evaluates to false, the file would be included anyway. 20. State whether the following file inclusion statements are True or False. i) If a file has already been included, include_once( ) will not execute. ii) After require_once( ) is encountered, any subsequent attempts to include the same file will be ignored. the best information about technology is in here!